Last semester, the IT department launched a new instance of WordPress to host sites for class projects. WordPress is a versatile and easy to use web platform that can be used for blogs, portfolios, traditional web sites, or combinations thereof. The way a WordPress site looks and feels can vary widely, depending on the “theme” chosen- and some of the newer themes are very slick-looking indeed. Also, since a large percentage of new websites worldwide use WordPress, this is a great skill for students to be learning. Two classes this past fall used WordPress- the course topics were very different, but the way they used WordPress was quite similar. Both faculty were drawn to WordPress because of its ability to easily let students incorporate visuals and multimedia into their projects. In Alex Dika Seggerman’s class, Globalizing Contemporary Art, the class focused for a couple weeks at a time on art from a given area of the world. 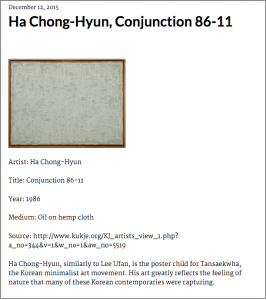 Each week, the students chose a work of art, researched it, and wrote a blog post about it for the class “archive.” The blog posts were then categorized, so someone browsing the WordPress site could view, for example, all the posts related to Korean art grouped together. 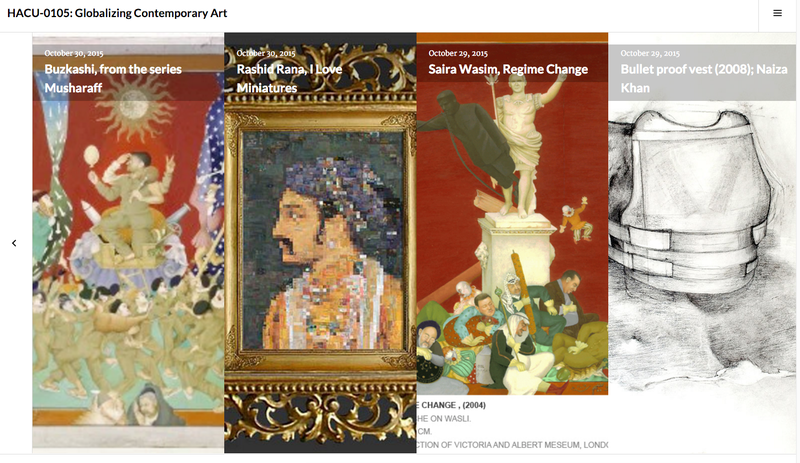 WordPress site for Globalizing Contemporary Art. Each image represents a blog post. Working with blog posts and categories is a great way to let students add content to the site and then display and group that content together in many different ways. It’s also easy to see one student’s work all on one page. A single blog post can contain images, media, links, etc, as well as writing. Rachel Rubinstein also had students write blog posts about the various themes and topics in her class, The Art of Being Jewish in (Post)Modern Times. We used categories in their site as well to pull posts on a given topic together. Both classes had a final project assignment which involved creating a digital exhibit. In Professor Seggerman’s class, students chose an item from the Five College Museums collections and created a researched web exhibit about the object. Each student had a dedicated page for this project on the class WordPress site. Some used the single page for their project, while others designed entire new websites dedicated to their art object and simply linked to those sites from the WordPress site. In this class, students had additional guidance from Kress Curatorial Fellow Jocelyn Edens on designing their exhibits. Professor Rubinstein also had her students complete a final project which was a curated multi-media exhibit about a topic of their choice (relating to the course subject). As above, students each had their own page on the class WordPress site where they built their “exhibits” which included writing, images, embedded media, links and references, etc. Both of these classes were studying contemporary culture in its various forms, so it made perfect sense to use a contemporary tool. That said, WordPress can work well for any class project where you want to students to collectively build a shared repository of information, or simply share content or ideas with each other. Web publishing is a key skill for students to gain experience in, no matter what their field. WordPress sites can be kept private to just the class, or just to the Hampshire community, or can be opened up to a wider audience (as long as copyright and FERPA guidelines are taken into account- hence the fact that we cannot share the actual sites with you!). Build in class time for students to learn to use WordPress. While most students can get up to speed fairly quickly, it’s essential to block out at least 45 minutes of class time to introduce both the assignment and WordPress itself. Have the WordPress project be a required assignment for the class that is tied to a key learning goal. While it can be nice to keep a blog on the side for a class, we find that these sites really don’t fully develop unless the WordPress project is fully integrated into the course. Since completing a successful digital project takes a lot of time and effort, think about substituting in the WordPress project for another project you might have assigned- don’t simply tack it on as an additional project. Interested in using a WordPress site for a class next semester?